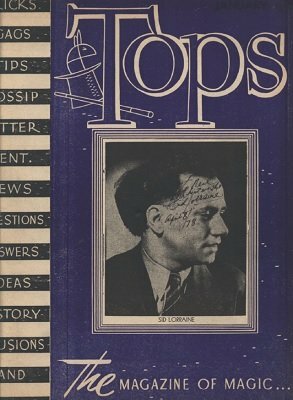 Tops Presents "Fooling The Public"
Production of Silks - William Mack, Jr.
Pop-Up Rising Card - William Mack, Jr.
Hitler's Passport [trick] Next Month! re: Cleveland Magicians & "Mysteries of 1942"
The Name is Jones - Lloyd E.
A four-page insert about the Tenth Annual Convention of the P.C.A.M. "No Coffin for the Corpse"
Flash! - P.C.A.M. Convention a "humdinger"
Jesse D. Thornton - A Wizard He IS! Plato and Jewell - Tops in Class!